Gangster State: Unravelling Ace Magashule’s Web of Capture convincingly makes the case that Ace Magashule is not just corrupt – deeply, spectacularly corrupt – but also potentially dangerous. Pieter-Louis Myburgh’s new book opens with the mysterious assassination of tenderpreneur Igo Mpambani in 2017. It was Mpambani – gunned down in his car in Sandton – who would posthumously provide some of the most damaging evidence in Myburgh’s book. A cache of Mpambani’s emails, bank records and spreadsheets was passed to Myburgh by an unnamed source. These documents, which Myburgh refers to as the “IgoFiles”, reveal the extent of corruption involved in a R255m asbestos audit contract given out by the Free State Department of Human Settlements during Magashule’s reign as provincial Premier. Mpambani ended up dead. Two years later, nobody has yet been prosecuted for his murder. His is not the only death to feature in Myburgh’s book. Noby Ngombane was made head of the province’s ANC interim leadership committee in 2000 after factional infighting. Part of Ngombane’s efforts to set the Free State on a better course included an attempt to introduce greater oversight into municipal spending. On Tuesday 22 March 2005, he was mowed down inside his family home. When Myburgh went looking for the relevant police record, he found it had gone missing – as have the records from a 2008 judicial inquiry into Ngombane’s murder. Myburgh stops short of directly implicating Magashule in these deaths, but sources throughout the book testify to a politician willing to stop at little to seize power and maintain it. Some of these sources are anonymous, but others were happy to go on record. Former Free State Premier Beatrice Marshoff is one of the book’s most vocal critics of Magashule, her former comrade. Marshoff told Myburgh that she axed Magashule as provincial agriculture MEC in 2005 because Magashule had issued an instruction to workers at a state-funded agricultural college to “slaughter the college’s calves” – and distribute the meat into parcels for distribution at a regional ANC conference in order to win votes for the Masgahule slate. Marshoff also reported that Magashule used his position as provincial chair of the ANC in the Free State to determine “who became mayor, municipal manager or CFO at all the municipalities”. Marshoff said that Magashule would then use those connections “to give tenders to people close to him or to people he needed to support him”. Magashule became ANC provincial chair in 2002, but Myburgh records that his dubious history pre-dates that election. In digging into Magashule’s earlier life, the journalist discovered that Magashule’s version of his heroic anti-apartheid activities is “replete with half truths, ample embellishment and a few outright lies”. Contrary to his public claims, Magashule was not a founding member of the Congress of South African Students (Cosas) in 1979, nor the United Democratic Front (UDF) in the Free State in 1984. Neither was Magashule arrested and charged with “high treason” as a result of his involvement with student protests at Fort Hare in 1982, as he claims – though he was charged with public violence. He also spent five months in exile, not 18 as he later claimed. A number of Magashule’s supposed comrades from that era told Myburgh they had never heard of him before the unbanning of the ANC. Writes Myburgh: “For someone who claims to have been so prominent in the struggle movement that he rubbed shoulders with the likes of Hani and Mbeki, Magashule left a surprisingly faint mark in the memories of his struggle contemporaries”. So how did Magashule rise so high in the ANC ranks that he now occupies a place in the party’s Top Six? The book is replete with incidents in which Magashule appears to have “bought” supporters or abused regional processes in order to ensure his continued election to high office. 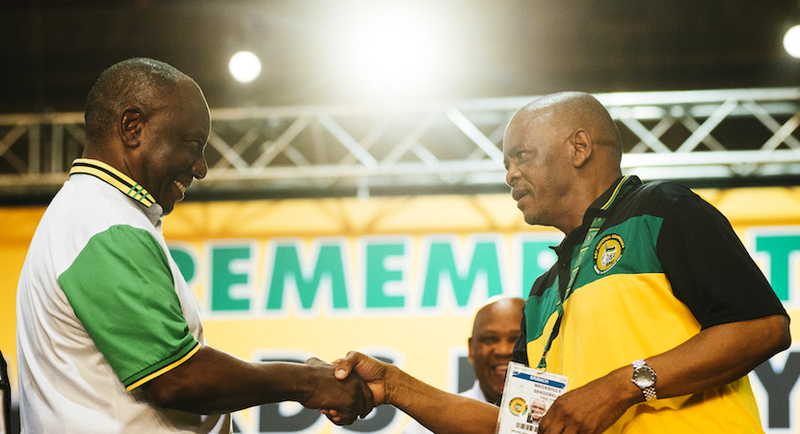 To give one example: Before Mangaung in 2012, ANC Free State had “somehow recruited almost 45 000 new Free State members in just six months” – which enabled the province to send more delegates to the ANC’s electoral conference. Questions still hang over the events of Nasrec in 2017, meanwhile, when Magashule scored a shock victory for the secretary general position over rival Senzo Mchunu, who had received more branch nominations. After reading Myburgh’s book, it is impossible not to suspect that Magashule’s victory owed something to dirty tricks. The corruption unpacked over the course of the book is so vast and sprawling that it becomes almost overwhelming. The book exposes for the first time how Magashule and his cronies “benefited from a R1bn spending frenzy that left in its wake hundreds of unfinished or poorly constructed RDP houses”, as a result of a Free State Development of Human Settlements scandal dating from 2010. Myburgh was informed by several sources that there were effectively no tender processes followed to determine which companies got contracts to build houses – instead, Magashule hand picked the favoured companies. As usual, the ultimate victims were the people of the Free State: some houses were never built; others left incomplete. The Magashule-led provincial government eventually took court action to try to retrieve funds from the relevant companies. While 96 companies were listed in court papers, the owners or managers of only four were explicitly named. “Of the four people named,” writes Myburgh, “three can be linked to political squabbles with Magashule”. The main beneficiary of another fraudulent project, to build a fully serviced neighbourhood on the outskirts of Bethlehem, was Magashule’s daughter Thoko Malembe. Writes Myburgh: “While [Magashule’s] daughter’s company made millions, these people are now left with substandard houses and no water, flushing toilets or electricity”. Magashule’s links to the Gupta family are also unpacked in the book in greater detail than has been made public previously. While the best-known Gupta scam in the Free State was the infamous Vrede dairy project – on which Magashule was “advised” by Gupta lieutenant Ashok Narayan – it was by no means the only one. Under Magashule, “the Free State government appears to have been the first major tax-funded dumping ground for [Gupta-owned newspaper] The New Age”. The Free State Department of Health also spent R25m on a medical firm specialising in mobile clinics linked to the Guptas, called Cureva (later Mediosa). Staff would remove medication and other supplies from government facilities to service the Gupta clinics – which explains, writes Myburgh, “how Mediosa could afford to ship the bulk of its revenues to Gupta-linked companies abroad”. The #Guptaleaks emails revealed that the Guptas were sent an email the day before the general elections in May 2014 with a list of names and numbers of hundreds of “ANC agents” in the Free State for whom cellphone airtime should be purchased. The person who forwarded the directive to Tony Gupta, Myburgh found, was Magashule’s daughter-in-law Kabelo Nthongoa. Magashule’s son Tshepiso lives in a house owned by the Guptas in Johannesburg. In light of all this, writes Myburgh: “If one had to identify the foremost enabler of the Guptas’ dodgy dealings in South Africa, it would be difficult to choose between Jacob Zuma and Ace Magashule”. The book also casts some light on why Magashule has not yet been prosecuted for any wrongdoing. Magashule was a vocal proponent of disbanding the Scorpions – and the book reveals that the Free State Scorpions were close to arresting Magashule just before the unit’s demise in 2009. Former Scorpions boss Shadrack Sibiya told Myburgh that they had “several solid dockets” on Magashule and had questioned him on several occasions. When the Special Investigating Unit wanted to probe the dodgy Free State housing contracts, meanwhile, its work was stymied by a private forensic firm called Open Water – appointed by the provincial government to look into the matter, apparently selected by Magashule himself. Open Water appears to have taken relevant documents and computers from government offices, with the result that the SIU was unable to access these materials. In January 2018, the Hawks raided Magashule’s office for evidence linked to the Vrede dairy venture. Myburgh’s information suggests that Magashule was tipped off well in advance, however, with “enough material to fill a small room” removed from the office of the outgoing Premier a few days before the raid.